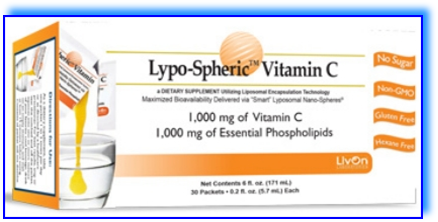 Each packet of Lypo-Spheric™ Vitamin C contains 1,000 milligrams of vitamin C and 4,000 milligrams of essential phospholipids (phosphatidylcholine). It is in a thick liquid form. of soybean derivation. 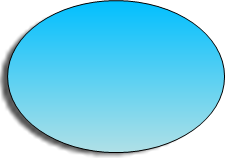 The vitamin C is bound -or 'encapsulated'- in sub-microscopic phospholipid spheres, each about 100 nanometers in diameter. This product is so designed as to enable the transporting of the vitamin C intact through the digestive tract (without digestive upset) to the liver, where it is quickly absorbed. Generally, efficiency of uptake of Lypo-Spheric™ Vitamin C is 10 to 20 times that of conventional vitamin C supplements. Aside from the vitamin C in this product, the phosphatidylcholine (essential to the transporting of the vitamin C) is of itself of very significant nutritional value. Lypo-Spheric™ Vitamin C is taken by snipping off a corner of the packet and squeezing out the contents onto food or drink. If taken in liquid, stir briskly. It will not dissolve but will become finely dispersed. It may also be taken by squeezing the contents directly onto the back of the tongue-followed by food or drink.